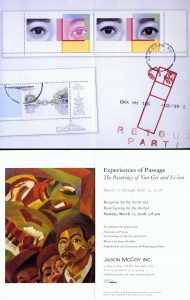 Jason McCoy Gallery is pleased to present Experiences of Passage: The Paintings of Yun Gee and Li-lan. The exhibition coincides with the publication of a new book of the same title by the University of Washington Press. The volume is generously illustrated and contains a comprehensive essay by the distinguished author and critic Joyce Brodsky. The gallery will host a book signing for the author at the night of the opening, Monday, March 17, 5 to 9 pm. Yun Gee (1906-1963) is widely considered one of the key figures in Asian American Modernism. He was born and raised in Chu village near Canton, China, before immigrating to San Francisco in 1921. He spent much of his life between Paris and the United States, in particular New York City, where he settled at the end of his life. Throughout his career, Yun Gee investigated many avenues of creative expression and pursued his interest in poetry, theater and dance. Today, his work can be found at The Hirshhorn Museum and Sculpture Garden, Washington, DC; The Los Angeles County Museum of Art; Musée national d’art moderne, Centre Georges Pompidou, Paris; The Oakland Museum; The Weatherspoon Art Museum, University of North Carolina, Greensboro, NC; Whitney Museum of American Art, New York, amongst others. Li-lan was born to Yun Gee and Helen Wimmer Gee in New York State, where she still lives and works. She has spent long periods in Japan and China. She has exhibited extensively in the United States and internationally, especially in Taiwan and Japan. Her work is in major public and private collections, including the Weatherspoon Art Museum in Greensboro, NC; the Parrish Museum in Southampton, NY; the William Benton Museum of Art in Storrs, CT; the Virginia Museum of Fine Arts, the Ohara Museum of Art in Kurashiki, Japan; and the Sezon Museum of Modern Art in Karuizawa, Japan.